It’s a Tree Ring Circus! 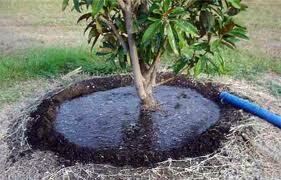 Obviously there are various stages of tree growth and mulch provides a number of benefits to the tree as follows. When a tree is a sapling (baby tree) and newly planted you create what is called a mulch “berm”. A berm is to be built in the shape of a tire. The berm starts approximately 8 inches away from the base of the tree trunk and should end at least 3′ out from the trunk. The center 8″ is completely level with the ground. The outer ring is just that, a ring, much like a doughnut with about a 6″ high bump that serves as a swell to hold water in when the sapling or baby tree gets watered or is fortunate enough to receive rain. Now here is where the confusion grows.. the tree berm should not look like a teepee, a muffin, a volcano, or any such shape other than a spare tire, or inner tube around the tree. Imagine if you took a child’s pool inner tube and placed it around your baby, you have a baby in the middle and tube around it, not up over it, not half covering it, around it. This is an example of what your berm or tree ring should NOT look like. The second area of confusion is what in the heck to do with that berm when your tree starts to grow larger. This is where a lot of people will build a rock fortress several stones high then fill it in with dirt because now it looks silly :-/…yes it does. Better still (sarcasm) they will build a very small diameter stone fortress (as shown above) that will one day be a prison for a growing tree that must have room to spread its proverbial limbs. Now you have an expensive pile of rubble and a girdled tree. 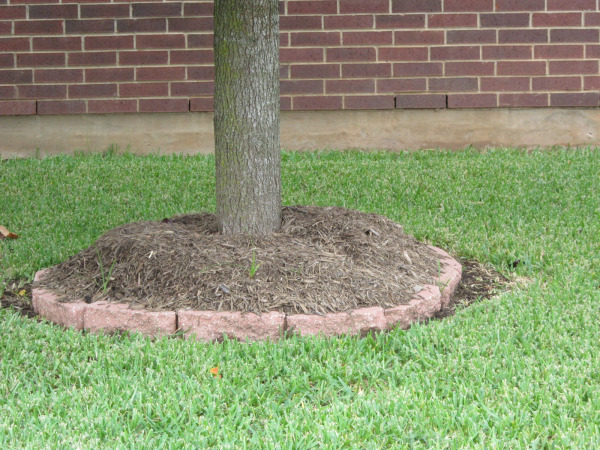 If you like the look of a stone border around your trees, make it large and low, you should be able to see the tree “flair” or “bell shape” at the base of the tree trunk coming from the ground. After about the 2nd year a tree no longer requires the mulch berm, now it needs a tree ring. A ring you say? Yes a tree ring that is wide and flat and serves another purpose than its rotund counterpart. I ask often and will continue to do so, “when was the last time you saw a tree in the woods and it had sod underneath it?” You didn’t, you saw organic matter and symbiotic plant life, but not a carpet of competition and sadness. Grass is a water hog and eats up all the trees nutrients by blocking the organic matter that would be there naturally. This is the purpose of a mulch berm. To hold and preserve water for a sapling or young tree. Once the tree is mature its roots are all over and no longer need a berm but instead need a ring of mulch/compost to provide a sod-free space for your tree to take in water and nutrients without the competition. I suggest after the first two years, you remove your tree stakes, remove an equal amount of sod as the drip line of the tree (the outermost limbs of the tree… imagine you had your arms outstretched and your fingertips would be the dripline) and in the Springtime you add about 1/2″ of compost, followed by a 1/2″ of mulch. Do this every year or two that the tree begins to branch out (no pun intended) and keep widening the tree ring a bit by removing a little more sod until the ring is as outstretched as you are comfortable with being as size appropriate as possible. As your tree grows, this is a great place for a bird bath, a bench, or some Xeriscape plants. Here is a proper tree berm for a young tree (all be it a large one), it should serve as a “well” to collect water. As the tree matures, you simply remove the “lip” around the edge of the berm and create a flat ring to serve as a barrier against the sod and as a place to add nutrients for the tree. 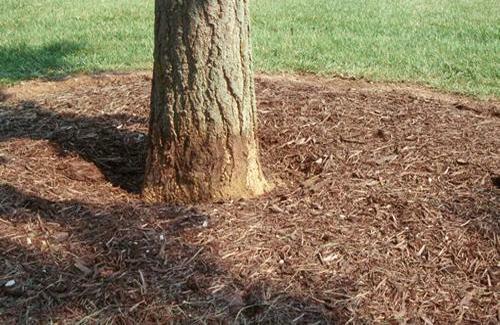 This is the proper way to mulch a mature tree. I remember this tree care lesson from you…which we follow even today. Truly makes all the difference to a young tree just starting out. Every time we pass a lawn with a tree base that looks like a volcano…we smile and think of you. I have a new neighbor who is from out of state and didn’t know about this. I told her about not making the big mounds around her trees (which she had done), so she is going to fix them and spread it out. I’m going to print this article and give to her, so she can learn! Thanks for the GREAT info, Lisa! I am glad it was helpful. So many people don’t understand the damage they are doing so good for you for sharing your knowledge. You’re a good neighbor!